Learning German with apps and self-study textbooks is a great way to start, but after a while translating isolated sentences and stuffing your brain with flashcards and grammatical explanations will not be enough anymore. 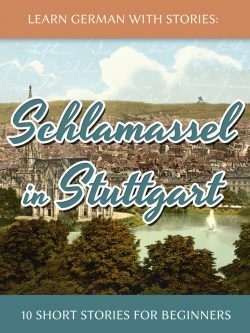 Whether you start looking at German children’s books, easily written short stories or German novels, eventually you’ll have to expose yourself to more real-world German. If you’re not the reading type, you can also learn German with on-demand TV series, German movies, or — as I’d like to show today — by watching German television channels. There are two big national German TV stations: ARD and ZDF. In addition to these, there are a variety of local or regional channels. All German public service broadcasts are funded through license fees paid by German viewers. Due to the non-commercial nature of these channels, you’ll find little to no advertising and a programming schedule which aims to share meaningful content instead of just whatever gets the most eyeballs. Well-known German private channels are RTL, Sat 1, Pro 7, Kabel Eins, Viva, VOX, N24 and many others. 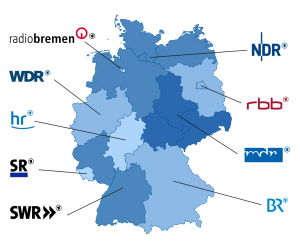 For a complete list of German television channels (both public and private), see here. Now that we’ve learned a bit about the German TV landscape, the obvious question is: how and where to watch? 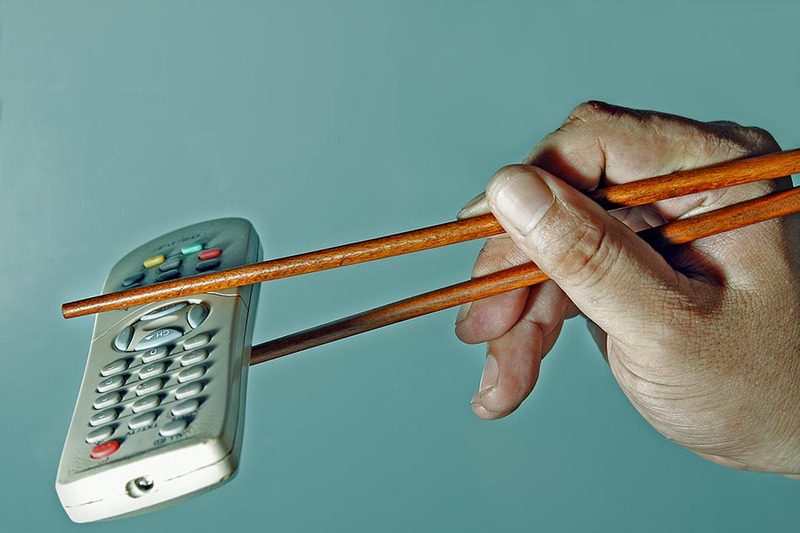 Sure, if you live in German you can just turn on the TV, but many German learners are living abroad, so let’s take a look where and how you can access German TV streams online. The ARD has an excellent media library which you can access via ardmediathek.de (also available as Android and iOS app). By clicking on the LIVE link you can watch the ARD stream and various sub-channels directly in your browser. 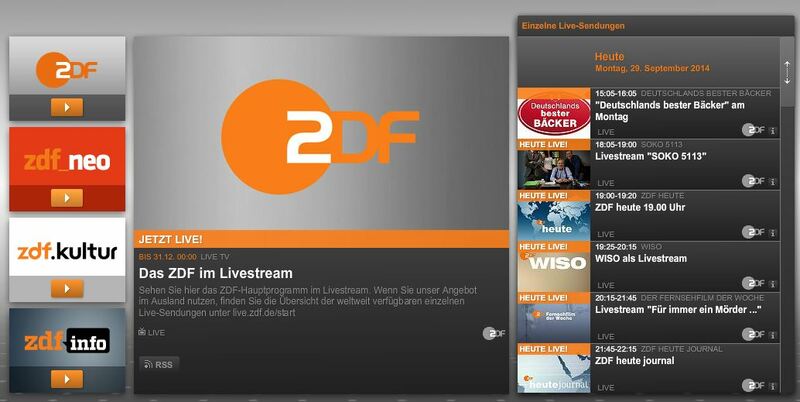 Also in the ZDF Mediathek, which comes with an Android and iOS app as well, there’s a link to the ZDF main live stream and its three sub-channels. Another great Mediathek with live streaming option is the one by Arte, a Franco-German TV network, which you can find on arte.tv (or as Android and iOS app). As for the commercial channels, the only Mediathek that I’ve tested so far is N24, and it’s not half bad, especially if you’re interested in documentaries, news and politics. While much of the on-demand content in these media libraries is available internationally, unfortunately some of the live streams are geo-restricted, which means that many watchers abroad will be left out in the cold. What to do? You could try to use a VPN (virtual private network) connection that will allow you to circumvent some of these restrictions. For example, I’ve found that by using unblock-us I managed to get access to the ZDF live streams while abroad (and some but not all ARD and ARTE programs). You can also try accessing some of these streams with Hola, or any other free VPN solution. Feel free to share in the comments below what worked for you. 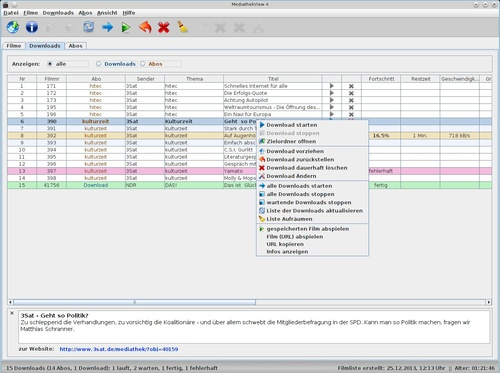 If you don’t want to experiment with VPNs, you can always just browse the Mediathek links above and pick one of the recorded programs that works in your area. 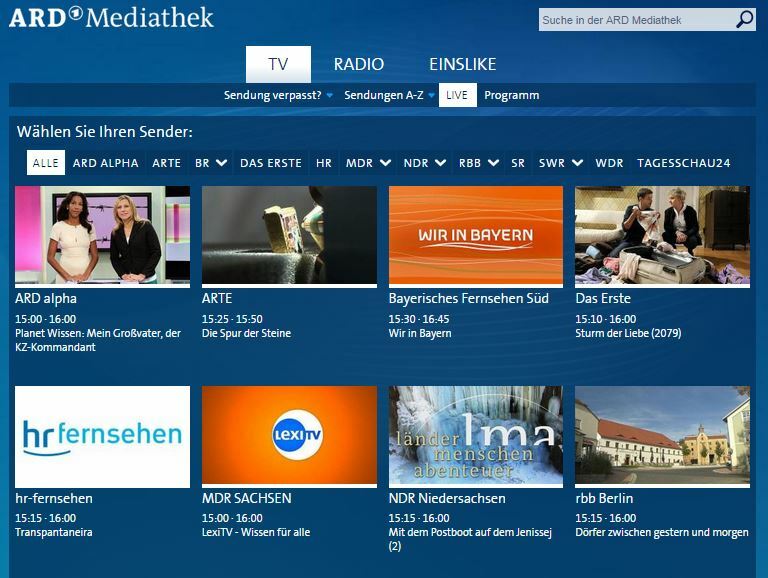 As great as the Mediathek offering of public broadcasters may be, many of the programs are only online for a limited time, so if you don’t stream them in the right time-window, they won’t be available anymore. Luckily, there’s MediathekView, a small free program that allows you to search through the big Mediatheks and download the source files so you can watch them whenever you want. So, if you need something to watch on that next transatlantic flight, you can fill your devices with tons of German TV shows and movies, totally free, totally legal. Besides going to the media libraries of the stations directly, there are a handful of services that aim to provide easy access to German TV from the browser or mobile devices: Zattoo (Android, iOS), Wilmaa, Teleboy all offer free plans, but before you get too excited: many of them are only available to the Swiss public (don’t ask …), so again, without a good VPN the chances of actually getting the streams to work is very slim. If you don’t want to break your head circumventing these geo-restrictions, you could also use one of the following sites and services, some of them which operate in a kind of legal grey zone. Then again, using VPNs may also be considered a legal grey zone. As always, in case of doubt, check your local laws. On this site you can watch a number of German TV stations (both public and private) directly in your browser. The streams aren’t high quality and the sites uses ads, but apart from that it’s workable. NOTE: This service uses peer-to-peer streaming (may be problematic legally since you’re uploading data), and in all likelihood provides these streams without permission by the stations. On this site you can watch five different German TV channels (Kika, ZDF, ZDF Info, Eurosport and Euronews), free of charge, without registering. Look in the menu for German TV. Stream quality is mediocre. I couldn’t find anything about the legality of this service, but according to Wikipedia, the company is no stranger no court skirmishes. With the help of this app, you can watch a number of smaller and regional public service stations. Since this apps appears to be using the official streams of German TV stations not all links worked. Apart from that, the app is great and provides fast access to German TV. all information is for educational purposes only and doesn't constitute legal advice.